Leipzig/Halle Airport is located in Schkeuditz, Saxony and serves both Leipzig, Saxony and Halle, Saxony-Anhalt, Germany. 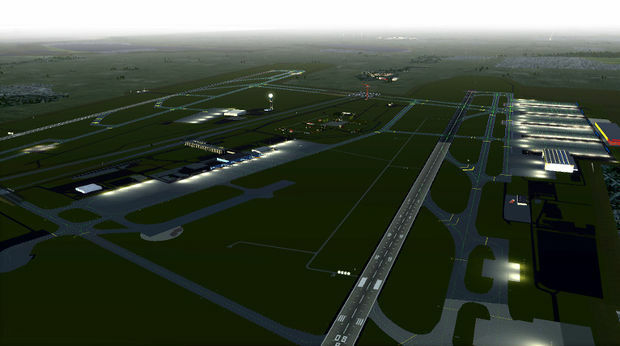 In Flightgear this airport was published on TerraSync in 2010 und updated due to new developments 2012. In 2014 according to the new world scenery a complete overhaul started. EDDP is also the centre of Leipzig/Halle airspace, which provides air traffic control also for the regional airfield Leipzig-Altenburg Airport. All diagrams and charts are available for download. The northern runway is 3600m long with a width of 45m. In real life its usually used by passenger airliners. 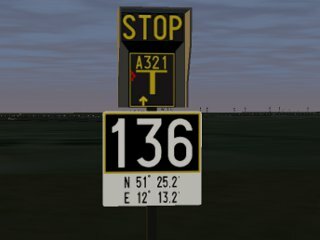 In Flightgear this runway is equipped with Outer Marker and Middle Marker and offers best conditions for low visibility operations. The southern runway is 3600m long with a width of 60m. 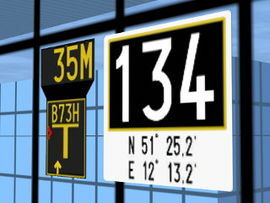 In real life its mostly used by freighters due to its proximity to freight areas (Apron 2 and 4). It has no Outer Marker an no Middle Marker. Leipzig/Halle Airport is regularly served by Air Traffic Control (ATC). Connected by terminal C and three taxiway bridges (W1, E7, E8) the airport layout combines the northern part with runway 08L/26L and Apron 3 (new cargo area since 2012) and the southern part with Apron 1 (terminal B), runway 08R/26L, Apron 2, Apron 4 (DHL), Apron 5. 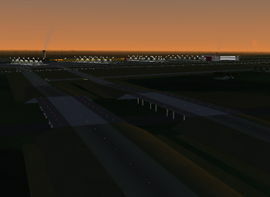 Between both parts an airport railway station and the autobahn A14 is connecting to the check-in area of terminal C. Railway and motorway are not modelled in Flightgear. 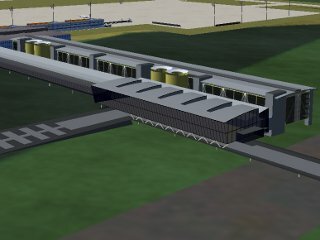 In August 2012 the completely new modelled terminal C was published on TerraSync. It is built as a connection between the check-in building with car-park and train station in the north and the departure area at terminal B in the south. Due to this efforts it stands on piers like a long bridge from apron 1 to apron 3, crossing different car-parks, a rail-track and the autobahn. 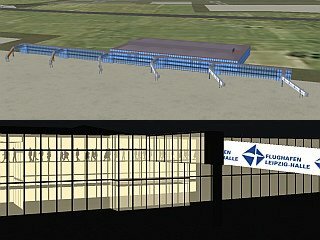 On the one hand the FlighGear model tries to give the airport a well designed model with highly detailed structures, but on the other hand it was programmed as simple as possible to save visitors simulation performance. A highway and railway lines go straight between the two runways. Three bridges connect the terminal with the northern runway. The western bridge (taxiway W1) is used in both directions. The eastern bridges (taxiways E7 and E8) are used as one way taxiways. Due to safety improvements all bridges are equipped with special taxi lights. Due to changes in the TerraData the bridges had to be repositioned in 2012. The main apron at Leipzig/Halle Airport is located in the middle of the airport. It houses the commercial aviation area at terminal B in the west and the general aviation area in the eastern part. It is connected by taxiways L, N and W1. This building is the main terminal for most commercial flights at EDDP. It is connected to terminal C in the north and provides the passenger transfer to Apron 1 via 6 gateways. It also has a connection to the luggage terminal. 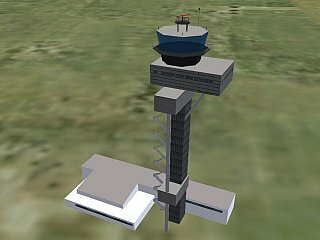 Scenery in TerraSync: In Flightgear the main terminal is modelled very slim and efficiently. 6 unmovable gateways link to park positions 126, 128, 130, 132, 134 and 136. In 2012 it will be improved. Since September 2012 it has been equipped with a non-animated VDGS. This Apron in real life went into service with a new cargo hangar in 2012. In Flightgear it is still closed. The corresponding facilities are still under development. Real world: Leipzig/Halle is just a small international airport. 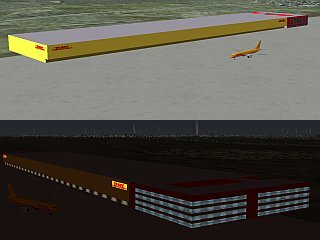 But in 2008 it became the European DHL hub with up to 60 planes per night. The DHL Hub Leipzig GmbH, place of business in Schkeuditz, is running under contract to the logistic group DHL at Leipzig/Halle Airport one of six international aviation hubs. In order to provide maintenance to the new fleet the European Air Transport Leipzig GmbH was founded. European Air Transport operates services to Europe, Middle East and Africa. 56 countries are covered in total. A second aviation company, called AeroLogic, was founded in EDDP. AeroLogic GmbH, a joint-venture between DHL Express and Lufthansa Cargo, is a German cargo airline headquartered in Schkeuditz, Saxony. It operates cargo flights out of Leipzig/Halle Airport and Frankfurt, most of which are on behalf of its parent companies. 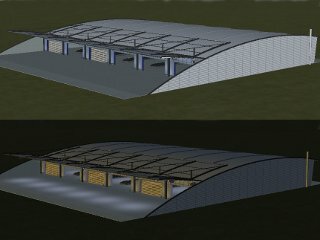 Scenery in TerraSync: The hub (warehouse, hangar and aprons) is modelled in the scenery. In 2012 its redesign for TerraSync started. First all lampposts at apron 4 had been replaced with those which fit into the correct layout of every single parking position. Afterwards lots of goods and ground vehicles where placed. As soon as some missing storage buildings are modelled, the new content of apron 4 will be published on TerraSync. Last modifications will take place when the new 850-standard layout of EDDP will be created in the future. 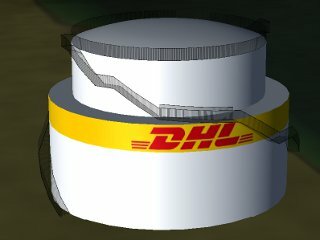 DHL-hub at EDDP in Flightgear: Leipzig/Halle Airport offers ground space for more than 70 Boeing 757-PF or up to 50 777F as well as space for 10 An-124 at Apron 2, 4 and 5. Airmail flights can be flown from and to EDDP. One of the middle sized and highly connected hubs of DHL, the Orio al Serio Airport (Italy) is also modelled in FlightGear and can be used for realistic flights out of Leipzig/Halle Airport. In FlighGear apron 4 is equipped with all stands. Additionally to the main apron lightning each stand has one centred lamppost, which will be replaced by a VDGS-signs in the future. Ground markings will come with the new 850-layout. 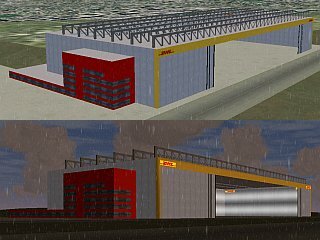 The major storage buildings from DHL are modelled as well as three DHL-tanks south from apron 4. 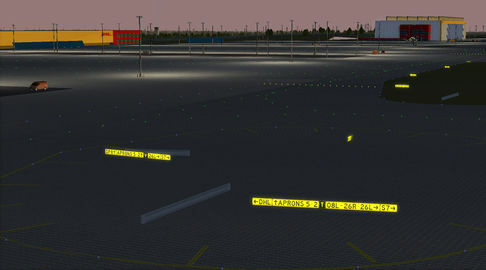 Leipzig/Halle Airport has four special areas, two in the north at taxiway C and two in the south at taxiway N. In FlightGear only the two areas at taxiway C are build into the layout. In 2012 both areas had been equipped with shared models like lampposts, buildings and ground lights. Based on the Zurich type model "Elephant" - originally modelled by Oliver Thurau - an improved version with full multiplayer support is under development. This version isn't only adapted to the special efforts at EDDP, but its also designed to be controlled by ATC. It will be published via TerraSync in November 2014. There is a village right in middle of the airport. So it's no surprise the number of inhabitants is shrinking each year. Once a thriving village with 537 inhabitants in 1950, they were down to 119 in 2006 (Wikipedia). It might be a little loud with the two runways, highway and express railways, but the transport links, hey ... The village is modelled in the scenery. 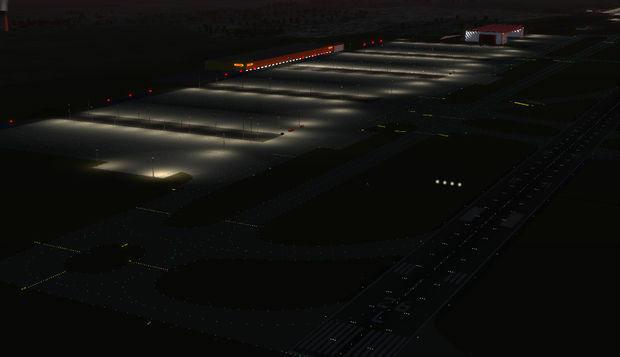 With FlightGear 3.0 a new world scenery was published, including a new but incorrect 850-layout for EDDP. Developers started a huge overhaul of the EDDP scenery in April 2014. 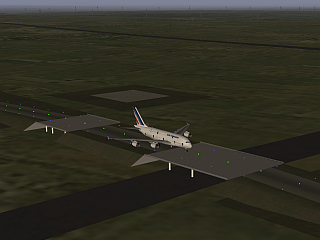 First a new taxiway layout was programmed. Additionally all buildings and objects are replaced. Some models will be remodelled, others will be added. Due to the fact that airport layouts can't be simply updated via TerraSync in a short way, pilots are asked to use the new EDDP CUSTOM SCENERY as long as things aren't updated at TerraSync. TerraSync has it all! There is no custom scenery existing (only the GIT-repository for testing the new 850-layout before publishing it). The authors believe on the advantages of TerraSync which makes it easy for every user to have the latest scenery installed automatically. Updates are published regularly via TerraSync. Here is a selection of the models. YouTube video 2010. This page was last modified on 6 March 2016, at 17:56.